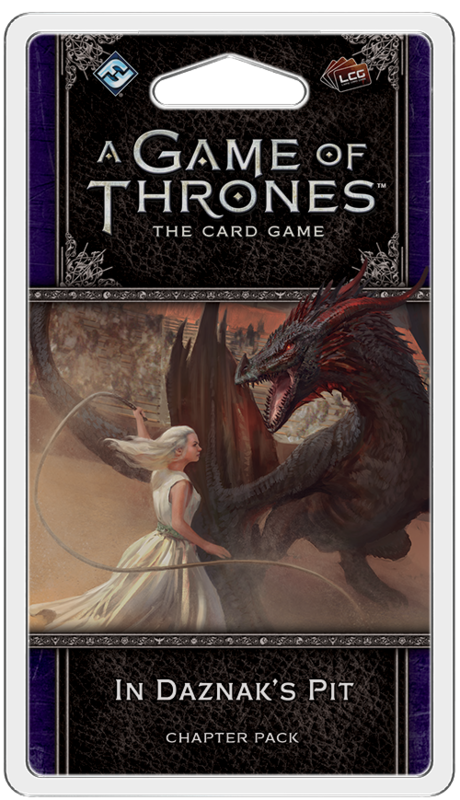 Daenerys Targaryen vaulted onto the dragon’s back, seized the spear, and ripped it out. The point was half-melted, the iron red-hot, glowing. She flung it aside. Drogon twisted under her, his muscles rippling as he gathered his strength. The air was thick with sand. Dany could not see, she could not breathe, she could not think. 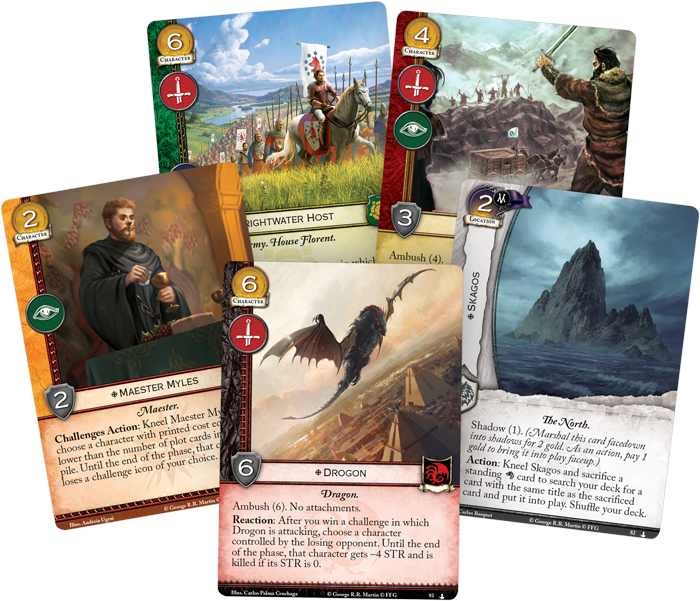 In Daznak’s Pit, the fifth Chapter Pack in the Dance of Shadows cycle for A Game of Thrones: The Card Game, is on sale now at your local retailer or online through our website! 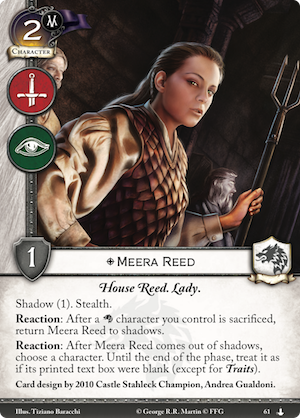 In the Dance of Shadows cycle, players are encouraged to use guile and intrigue with the return of the shadows mechanic. As anyone familiar with George R.R. Martin’s A Song of Ice and Fire is all too aware, places are haunted just as often as people. Upon learning that Rickon Stark is alive, Wyman Manderly has tasked Ser Davos Seaworth with retrieving the young heir of Winterfell. 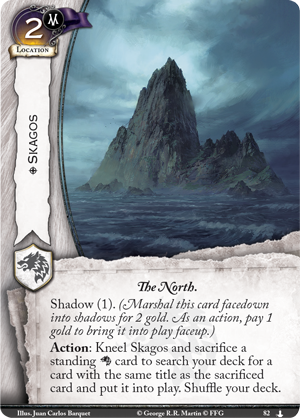 Rickon is rumored to be hidden on the mysterious island of Skagos (In Daznak’s Pit, 82), where even Northmen fear to tread. 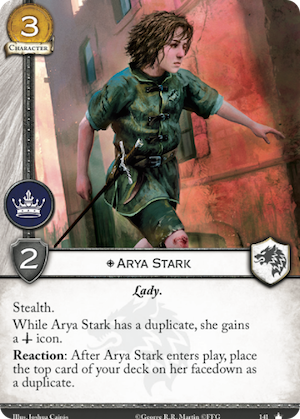 This is the perfect place for a fugitive to lay low, allowing you to use an action to kneel Skagos and sacrifice a standing Stark card to search your deck for a card with the same title and play it. 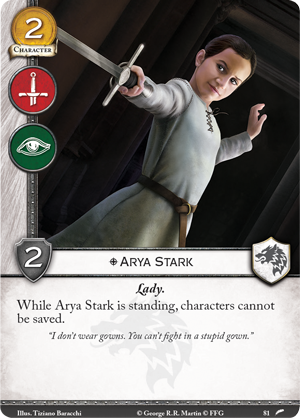 You may use this to switch out different versions of key characters like Arya Stark (Core Set, 141) with her more deadly iteration (The Faith Militant, 81). 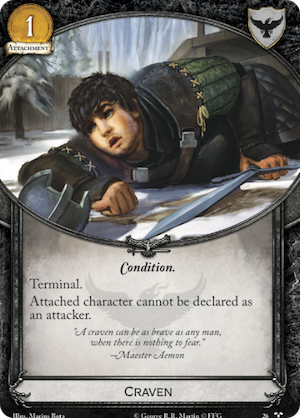 More pertinently, however, it allows you to trigger your powerful rewards for sacrificing characters, such as Wyman Manderly (The March on Winterfell, 21) or Meera Reed (Music of Dragons, 61) without losing vital characters from your board. 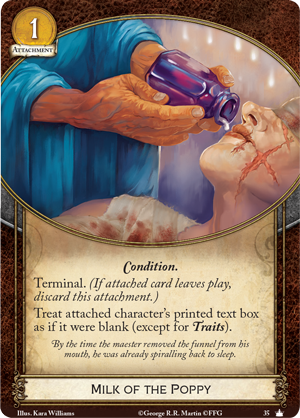 Or, you may use Skagos to clear away your opponent's attachments, freeing your character from Milk of the Poppy (Core Set, 35) or Craven (Called to Arms, 26) And with Skagos’s use of the shadow keyword, you can keep the island veiled from your enemy’s eyes, drawing them in until you are ready to radically alter the battlefield and confront them with your most deadly warriors in a single, blood-soaked turn. 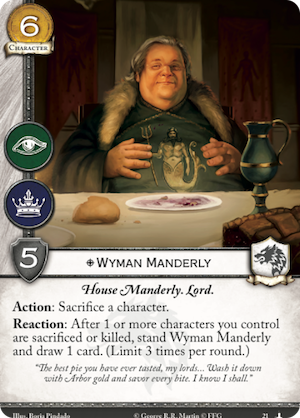 As Wyman plots to return the Starks to power, he must still play the part of the Bolton’s loyal subject. But soon the mummer's farce will come to an end with all lies exposed, and this theme stretches all the way to the streets of King’s Landing where Cersei Lannister must confess her crimes in order to regain power and ultimately destroy her accusers. 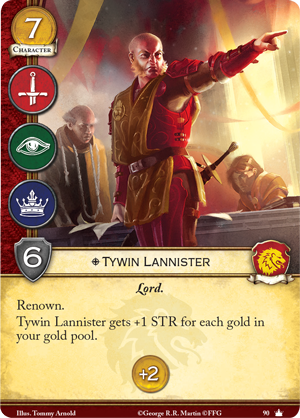 If you align with Cersei and the Lannisters but become tangled in your own web of deceit, you may be forced to take a Walk of Atonement (In Daznak’s Pit, 90). Fittingly, this card cannot be hidden in the shadows, but it does still have the power to turn the tide in your favor. 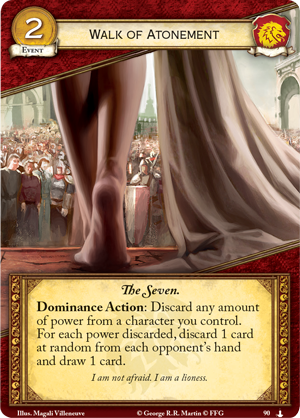 During the dominance phase, you may use this event to discard any amount of power from a character you control, discarding a card from your opponents’ hands and drawing a card for each power lost. While it may be difficult to part with your power, this may prove to be your saving grace. 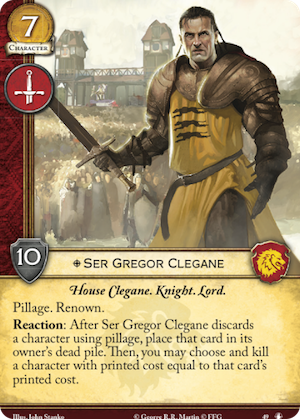 Characters like Tywin Lannister (Core Set, 90) or Ser Gregor Clegane (The King’s Peace, 49) are often obvious targets for your opponent, as they are too dangerous to live. If your enemy brings these characters to the brink of death, Walk of Atonement lets you put their power to good use before it's lost. You may even be able to completely shred your enemy’s plans while simultaneously gaining the implements you need to reform your own. 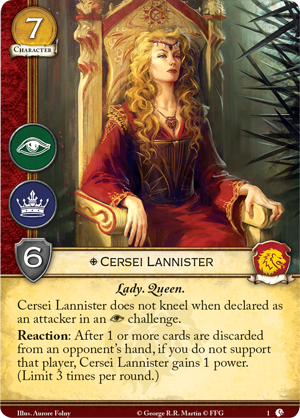 And of course, if you play Walk of Atonement on Cersei Lannister (Lions of Casterly Rock, 1) herself, you can recoup a piece of the power you lost as your oppponent discards cards from their hand. Pick up your copy of In Daznak’s Pit (GT35) at your local retailer today or on the Fantasy Flight Games website here!